Tickets for most Arena Theater live shows are available in advance from the four outlets listed below. Tickets can also be purchased at the Arena Theater box office beginning 30 minutes before show time. Due to the limited seating capacity of the theater it is always a good idea to purchase tickets for live events in advance. Tickets for most first-run films are only available at the Arena Theater box office on the day of the show, beginning 30 minutes before the scheduled start time of the film. Tickets for some special film events may be available at the usual ticket outlets. 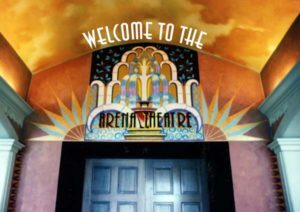 Tickets for almost all of Arena Theater’s live events are also available online at www.brownpapertickets.com. *Please note, if any of the listed outlets is sold out of tickets, there may still be some tickets available at another outlet or online at www.brownpapertickets.com. Calling another outlet is a good idea. Although you may wait a day or two for a response, you may also confirm the status of a show by calling the theater at 707-882-3272 or sending an email to the General Manager at Jazzdavid@aol.com. Join the Arena Theater Association today!